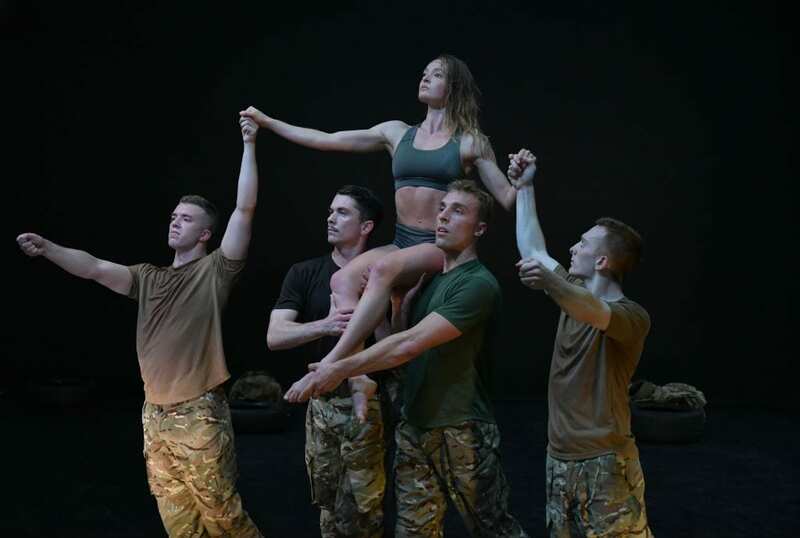 After a sell-out run in Edinburgh, 5, Soldiers, by the Rosie Kay Dance Company in collaboration with the British Army and Sadler’s Wells, comes to London. 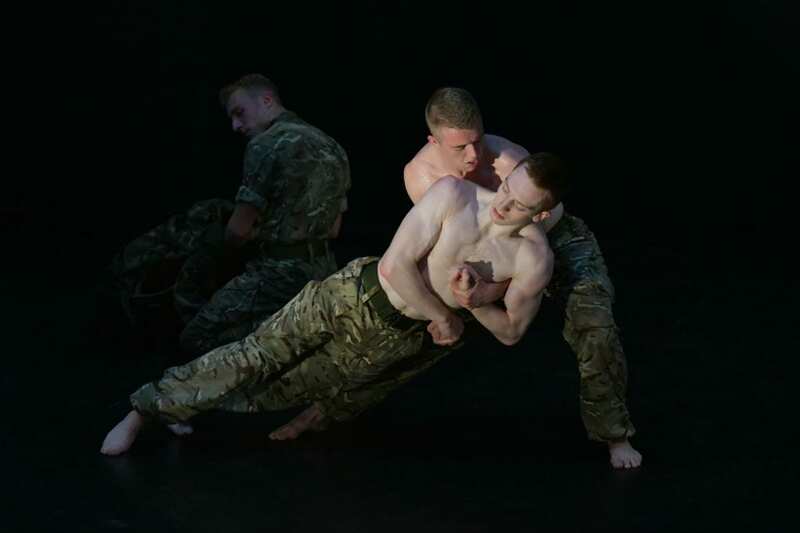 Its context is inspired: the exploration of the body as a frontline in Dance and in a corporeal reality central to army life. Kay dissects this on the stage with honesty and integrity: drills, repetition, and in many cases pertinent to both arenas, injury. 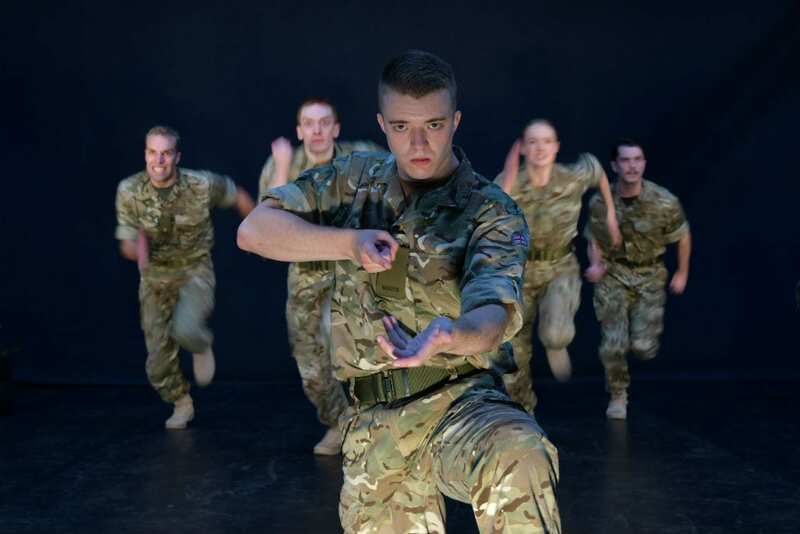 Its London venue, the Yeomanry House, home to the British Army Reserves, is a natural, theatrical backdrop. Pictures of soldiers mired in mud adorn the walls, together with biscuit-coloured roll-call scrolls, a universal reminder of institutionalised rewards and sacrifice, while the wooden floor echoes the ghostly booted-steps of previous generations of pack-drills. The dancers, in battle-fatigues, serve Kay well. Their youth emphasises the many who progress through the ranks in each discipline; the peak of fitness, the peak of readiness, fuelled by adrenaline. The highly choreographed sequences stretch out over a 65 minute programme and take us through drills, down-time, the’ tour’ and rehabilitation. It is a neat theatrical arc. 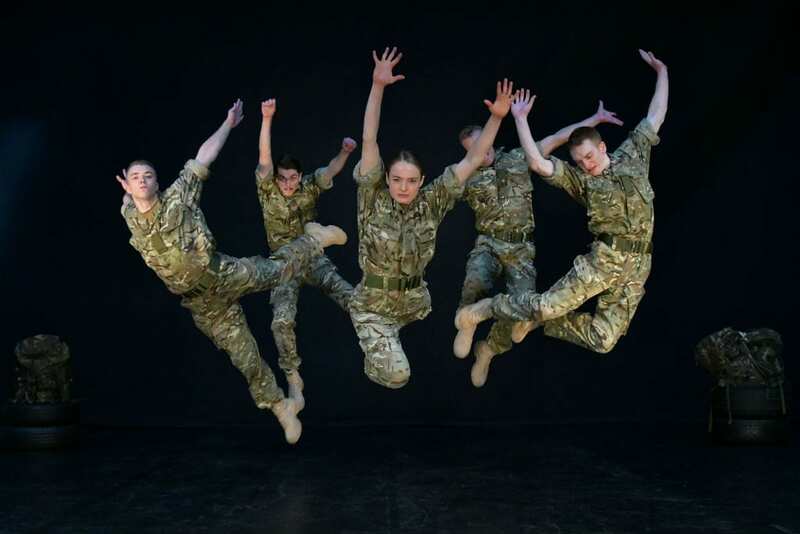 The soldiers are cannon-fodder and a highly disciplined machine, largely described in ritualised movement: from class and drill basics to complicated pas de deux and complex movement. There is a standout sequence as the soldiers progress through a booby-trapped complex, riddled with sniper-fire, using an elaborate series of gestural signals and patterned formations. Their arms depict a shoulder-anchored gun, the image is a stark reminder that the body is a killing machine yet vulnerable to attack. We live out this intensity with the dancers, drawn into a drama in which the two worlds elide. The dance sequences, particularly the free extensions of Harriet Ellis, and the poignancy of the ‘Jack-the-lad’ final sequence, as the body confronts a new axis for movement, are particularly strong. It is at these moments that Kay’s vision is fully realised. 5 Soldiers is an intelligent and inspiring collaboration. It works because of Kay’s sincerity and her talented, intuitive group of dancers, even if they are more comfortable in their natural habitat than with the spoken word. Annie Mahtani’s elevated music soundscape, features eighteenth century oratorio in perfect juxtaposition with Dolly Parton and Katie Perry. A minimal set – tyres, kit-bags – keeps the action fluid and re-defines the space in one of the best site-specific productions in recent years. 5 Soldiers – The Body is the Frontline tours nationally; catch it if you can.